Lancashire's financial future has been secured after being awarded an Ashes Test against Australia in 2019, says chief executive Daniel Gidney. 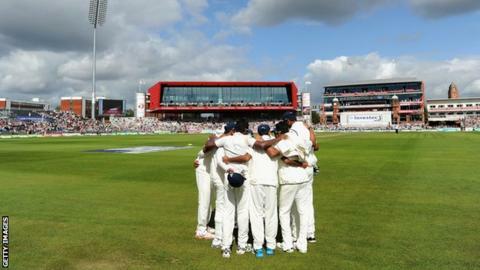 Old Trafford missed out on Ashes selection in 2015, despite England winning the 2013 series in Manchester. The ground has also been given a 2017 Test against South Africa and five 2019 World Cup games including a semi-final. "This completely underpins Lancashire financially for years to come," Gidney told BBC Radio Manchester. "An Ashes Test, and let's not forget a World Cup, coming to Manchester is absolutely fantastic. It's huge for the region. "For Lancashire County Cricket Club, this is enormous news." Lancashire missed out on staging an Ashes Test in 2009, but spent £32m on redeveloping the ground, which included rotating the square and building a new media centre. Gidney confirmed building work on the four-star hotel that will replace the Old Trafford lodge, will start at the end of 2015.